I am facing the same problem. I start monitoring the regions and the method didEnterRegion is triggered even if i am really far. I didnt test your solution yet, but i think that way if the region does not contain the user location, the didEnterRegion will not be called again until the didExitRegion is called. I will test your solution and provide a new feedback. I’m sorry for my english and thank you for sharing. This solution is not working for me. my thought is same as TIAGO PEREIRA’s. So I’d like to know the real cause of the problem. 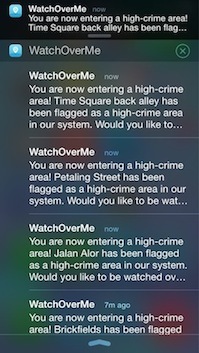 As far as I search about geofencing, it seems possible to get accurate notifications like 100 meters. If you’ve already found out the reason, please tell me, please. Thanks for writing about this – i’m having the same problem and couldn’t find anyone other than you talking about it. containsCoordinate isn’t really how I want to deal with this, but it will have to do for now. If you’ve any updates on this, since the original post, i’d love to hear about it. Just wondering. Did you file a bug report to Apple? It seems weird, as it’s a pretty serious bug they don’t seeem to address. I’m seeing this same behavior in iOS 8.4. I have a large(ish) user base that will send webhooks to my server based on didEnter and didExit region monitoring. In my webhooks I’m sending the details of the geofence that the user triggered and the user’s location. With that data, I’m finding a large number of users (~80%) sending me webhooks are really far away – several kilometers – from the geofence! Here’s the rub, the horizontal accuracies from the user’s location are actually pretty good, some as low as 10m. I can recreate this behavior when I turn WiFi off. My experience has led me to believe that perhaps region monitoring isn’t interacting correctly with location data from the GPS. I’ve adopted your solution and see that manually forcing the comparison of region area against the manager’s location. Does anyone notice this behavior when WiFi is on? Is it possible that region monitoring isn’t getting data from the GPS (that seems crazy)? **HERE is fullproof working solution/fix for iOS geo-fencing glitch ! //we need to take new instance of given region for which the iOS triggers entry event..Adding 50.0 meters is needed just to make sure that containsCoordinate method of CLCircularRegion works well.Because there is lag/difference measured in our real time field testing that brought us to this conclusion and it works like a charm. Actually still i did not attender stand how it will going to helpfull. How can i use this in my situation.